Themed nursery area rugs are an easy and inexpensive way to add creative themed decor to your baby nursery. They are available in hundreds of different sizes, shapes and colors to coordinate with almost any theme imaginable. Take a look at some of our favorite baby room rugs... at Amazon.com . They have a huge selection of themed baby rugs just perfect for your nursery design! Large Rugs With Themed Borders. The number one rule in baby nursery decorating is to avoid the cluttered feeling created by making the room too busy. Too much themed nursery decor is the quickest way to ruin your nursery design. Large area rugs covered in a theme picture with or without a border. Large area rugs with a themed border and solid center. The trick is knowing which of these rugs is the best one to use in which baby room. Follow these guidelines when deciding which of the many available nursery rugs you should go for. Nursery rugs such as these should be used as the focal point for the nursery room. This means using fairly plain bedding and window treatments. They can still be themed, but not with a heavy pattern. As soon as there is something else in the baby nursery drawing attention to the eye, the rug will give the room a busy feeling. The smaller the baby nursery, the more evident this will be. If you use a large themed area rug, make sure that, in addition to fitting your theme, it picks up your color scheme accurately. Never add the wrong rug to the room for the sake of maintaining your nursery theme. If you cannot find a baby room rug in the right theme, with colors to match your nursery color scheme, leave it. Rather choose a solid or patterned nursery area rug in neutral shades or an accent color. 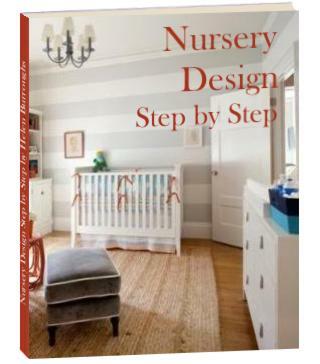 Use other decor elements to consolidate your nursery theme. Alternatively, if you have seen a themed rug that you absolutely must have, build your baby nursery design around it. Choose your color scheme by picking up two or three colors from the rug. These rugs work well if you have decorated your baby nursery walls with murals or wall stickers. A full themed rug would often be too much in this instance. A rug with a solid center in a neutral or accent color with a themed border is just what you need to pull the room together. Try to find a rug with a border that picks up on an element of the wall mural. This will help to balance your design. These rugs also work well if you have used a wall border. Use the border on the rug to bring out the detail in the wall border and to balance the room. As with large themed rugs, finding the right accent color and border together can be a challenge. You could look for a bordered rug in a neutral color, or stick with a solid or patterned nursery area rug as explained above. These rugs are great for adding the finishing touch to your baby nursery. They work best on their own or if your main nursery area rug is in a neutral color. If you have a large themed or accent colored rug already in the baby nursery, your accent rug will tend to get "lost". The exception to this is if you have a large baby nursery and are using the two rugs in separate areas. Small accent rugs are for decor purposes only. They do not provide the many benefits of larger nursery area rugs. Try to anchor your small rug by placing it close to an item of baby furniture, for example, at the end of the baby crib. A small baby room rug in the middle of the room floats and looks lost. It's also just waiting to be tripped over. Nursery decorating with themed nursery rugs can be great fun!